After eight years and scoring the winning goal that got Chelsea FC their 2012 UEFA Champion’s League trophy, Didier Drogba said he will be leaving the Blues this June. The 34-year-old Ivorien footballer has helped the team win 10 titles, scored 157 goals, and made 341 appearances for the team after almost a decade with the team, and was seen as a huge part of the team’s successes in recent years. Still, a protracted battle over his contract – the Chelsea bosses refused to grant him a two-year extension on it – saw the player make the decision to leave for what one hopes is a greener clime. We have known for some time that this outcome was likely but Didier and the club only made a final decision on that in the last couple of days, because for obvious reasons neither Didier nor the club wanted to distract focus away from the Champions League final. “The talks were amicable all the way through and we wish him all the best for the future. He is welcome back to Stamford Bridge at any time – either as a player or as a guest of ours,” Gourlay concluded. There are rumours that he is moving to the Far East – China to be precise – to join the Shanghai Shenua, but these have yet to be confirmed. I don't want drogba to go. 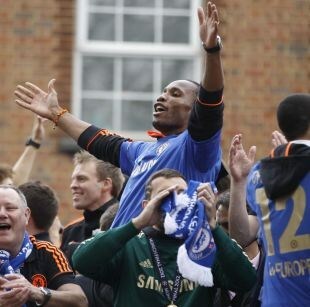 Leave PSC nd take Drogba's position in chelsea.